Didn’t Hellbender just throw their 3rd Anniversary party? Wow, where did all the time go? 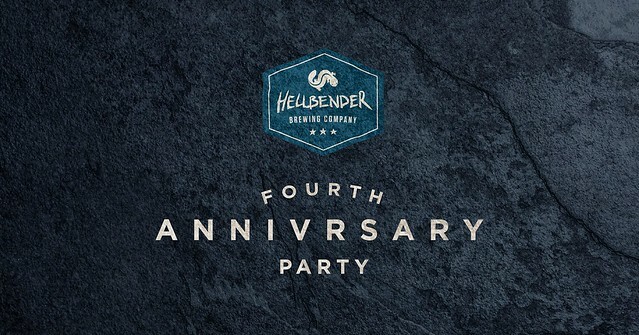 Now Hellbender is turning 4 and you can join the celebration at the brewery on November 10th. Hellbender’s last year turned out to be pretty big, as they started to release their beers in cans. They will release a new beer for their party and re-release one of the first they offered. 1. The re-release of the Double Chazzwazzer Imperial IPA (8.5% ABV). 2. A limited release of the Groundskeeper Islay Scotch Ale (aged in One Eight Distilling whiskey barrels) (9.2% ABV). Tickets are good for admission and your first beer. You can also devour pizza from Cipolla Rossa Pizzeria and/or oysters from Sapidus Farms and order custom made t-shirts! Tickets are $10 (includes first pint!). 12-7pm.